Last week, FX's hit animated TV series Archer wrapped up its seventh season, although FX has not yet issued a renewal for Season 8. Every now and then, rumors surface about a potential Archer movie, and whether or not it would be live action or animated, like the TV series itself. While we still don't know for sure if a movie will ever happen, the producers only have one actor in mind to play the beloved spy Sterling Archer. If you haven't caught up with this most recent season of Archer, there will be SPOILERS below, so read on at your own risk. While it isn't known if and when FX will issue a Season 8 renewal, Season 7 ended on quite the cliffhanger, with Sterling Archer (voiced by H. Jon Benjamin) laying presumably dead in a Los Angeles pool, his body riddled with bullets. As we await the fate of Archer Season 8, executive producer Matt Thompson revealed to The Daily Beast that Mad Men star Jon Hamm is the only actor they want to play Sterling Archer in a live-action movie. Here's what the producer had to say below. "It's Jon Hamm. If Archer goes live-action, I do believe it will be Jon Hamm. Maybe you could do it with Jon Benjamin's voice coming out of him? I don't know. (Series creator) Adam (Reed) is always like, 'I don't know if I want the movie to be live-action because I want it to be Jon Benjamin!' But if it is live-action-and if it is not Jon Benjamin-it is our greatest hope that it would be Jon Hamm. I can say that with confidence." Jon Hamm himself is no stranger to the world of Archer, voicing Captain Murphy in the two-part episode Sea Tunt which served as the last two episodes of Season 4. 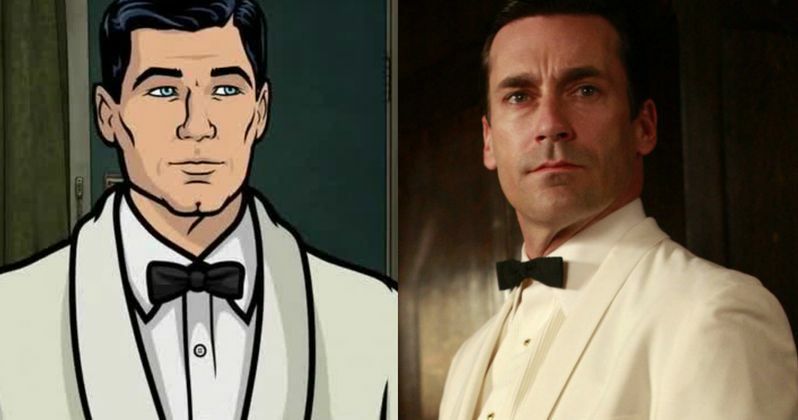 The producer also admitted that Sterling Archer's look was heavily influenced on Jon Hamm's iconic AMC series Mad Men, which debuted in 2007, two years before Archer arrived on FX in 2009. Here's what the producer had to say about how Archer was influenced by Mad Men. "We're working on a way to create an H. Jon Hamm Benjamin hybrid. The production and costume design obviously owe a great deal to Mad Men's repopularizing the 1960s aesthetic, and Archer's character model is just lucky enough to be that handsome in real life. Which is probably why he's a model, now that I think about it." As for whether or not a movie will ever happen, that's still up in the air. Matt Thompson revealed that the producers discuss the potential for an Archer movie every two years or so with series creator Adam Reed, but he adds that the final decision rests with Adam Reed. Here's what he had to say below. "It's all up to whatever Adam [Reed] wants to do, but he and I have definitely talked about it. I think we talk about it once every two years. We vacillate between if you do it, why are you doing the TV show? And should it be live-action, or should it be cartoon? The talk is there, we just still haven't decided. I don't think there will be a movie before the last episode of Archer airs on TV. I don't think we'll make a movie before the series finishes." The decision to not make a movie until the series has wrapped up was influenced by one of Matt Thompson's friends, David Willis, who worked on the animated series Aqua Teen Hunger Force. David Willis claims that the decision to make the Aqua Teen Hunger Force movie while the show was still on the air "negatively impacted" the viewing of the actual show, which has influenced the Archer team quite a bit. As for Jon Hamm, he will next be seen on the big screen in Absolutely Fabulous: The Movie, arriving in theaters July 1, and Keeping Up With the Joneses, arriving October 21. He recently wrapped on Edgar Wright's Baby Driver, which is set for release on March 17, 2017. We'll be sure to keep you posted on the status of an Archer live action movie as soon as more updates come in.